Pave your way into West Hills' history by purchasing a custom-engraved brick paver that will forever welcome visitors to our athletic stadium. Phase II of the Foundation's Legacy Paver project continues where the existing pavers stop. 4" x 8" or 8" x 8" bricks with your custom text will have a new, more updated appearance. Legacy Pavers can be laser engraved with a family name, student name, business name, or the name of a cherished loved one. 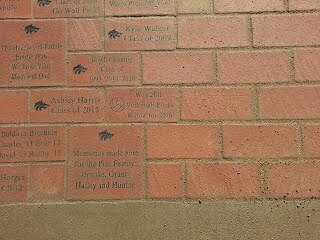 Support your student and the WHHS Foundation by purchasing a custom brick paver for $100 or $200 today. First, fill out an Legacy Paver order form (online version), and then pay using the Paypal link below. If the contact information you provide on the order form does not match your Paypal account information, make sure to add a note in Paypal to help match the payment to the correct form.